BACK in the day, in mid 2012, before the inception of this geo-political /investigative blog site, much work was done behind the scenes to track down this and that jihadi. Mind you, the findings from said investigations were (mostly) designated for select eyes and ears, only bringing certain results to the public’s attention. Rest assured, those who “merited” (and still do) such attention were always rated as “top terror dogs”. Special cases. BUT before we get to some specifics, it must be internalized that this site warned readers: HUSSEIN Obama, if re-elected, will present a clear and present danger to America (the free world), as well as to Israel. Unbridled. This was not said lightly, nor without requisite back up, despite threats generated in this direction. YET, for more “proof(s) in the pudding”, what else needs to be said about his Islamic devotion, than to demonstrate how far he will go to shield their barbarism at every juncture, leaving rational folks speechless. Breathless. Called “a master manipulator” by a federal judge, Al-Arian pleaded guilty to one count of “Conspiracy to make or receive contributions of funds, goods or services to or for the benefit of the Palestinian Islamic Jihad (PIJ), a Specially Designated Terrorist. Al-Arian was sentenced on May 1, 2006, to 57 months in prison (which includes 38 months time served) and has agreed to be deported after serving the prison term. Credit for serving his sentence has been frozen by a contempt citation due to Al-Arian’s refusal to testify before a Virginia grand jury investigating the International Institute of Islamic Thought (IIIT), a think tank that supported Al-Arian’s Tampa operation. Though he cannot be charged with a crime if he provides truthful testimony, Al-Arian argues his plea agreement should spare him from testifying. Al-Arian spent more than a decade lying about his involvement with the PIJ, including in meetings with an FBI agent as early as 1991 and in an interview with Steven Emerson for the documentary “Jihad in America.” Evidence uncovered during the investigation into Al-Arian showed he may have drafted the manifesto of PIJ. In his book American Jihad: The Terrorists Living Among Us, Emerson gives evidence of how, at USF, Al-Arian founded and headed various terrorist fronts that operated as “the American arm of Islamic Jihad,” and how Al-Arian damned the United States and Israel rhetorically while raising funds for terrorism overseas. Emerson also had surreptitiously videotaped Al-Arian at a rally exhorting attendees, in English, to donate $500 so that a Palestinian terrorist could be financed to kill an Israeli Jew. Former U.S. attorney John Loftus, meanwhile, had obtained videotapes of Al-Arian exhorting murder in Arabic, and Loftus initiated a lawsuit to pressure the U.S. government to prosecute Al-Arian for complicity in international terrorism. The government was slow to act, however, partially because of Saudi pressure. But on September 26, 2001, Al-Arian appeared on Fox News Channel’s O’Reilly Factor. 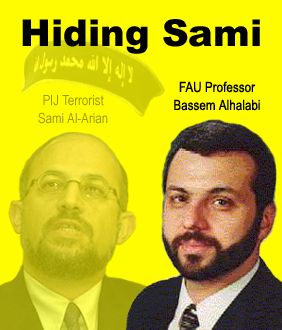 The host confronted Al-Arian with his videotaped calls for terrorist jihad and declared, “If I was the CIA, I’d follow you wherever you went.” The ensuing public uproar produced enough embarrassment to USF officials that they finally suspended Al-Arian from his professorship, with pay, on December 19, 2001. WITHIN this paradigm, of special significance is Sami Al-Arian’s destination, Turkey. The fact that HUSSEIN Obama and Turkey’s Erdogan are in league, well, that about sums it up. Some are cheering the news that convicted terrorist Sami al-Arian has been ‘deported’ to Turkey. Upon further review, this deportation may be closer to the ones given to the Taliban Five who went to Qatar along with $5 Billion in exchange for deserter Bowe Bergdahl. Where al-Arian is going – and where he is not – speaks volumes. According to a report published on al-Arian’s ‘deportation’, Egypt would have been a better fit for al-Arian to go. That is where he lived prior to coming to the U.S. and that is where he was once expected to be deported. If the Muslim Brotherhood was still in power in Egypt, that destination may have been more realistic. Instead, al-Arian was ‘deported’ to Turkey, the same country so many Muslim Brotherhood leaders fled to after Mohammed Mursi was removed from power in Egypt. Now that Gen. Abdel Fatah el-Sisi is in power there, al-Arian likely would have been jailed upon landing in Cairo. Now, al-Arian is a candidate to join Muslim Brotherhood collaborators who seek el-Sisi’s overthrow from Turkey. Keeping that clip in mind, fast forward to early 2010. A man by the name of Rashad Hussain was announced as Barack Obama’s envoy to the Organization of Islamic Cooperation (OIC). Coinciding with his appointment, it was learned that in 2004, Hussain defended al-Arian at a Muslim Students Association (MSA) event. However, Hussain was caught in a coverup and was then caught lying about it; he was not fired and holds the same position today. It was a story that never should have gone away but did. The coverup had to do with an article published in the Washington Report on Middle East Affairs (WRMEA). Below is a short video from a news report that appeared on the Fox News Channel. At this point, quotes originally attributed to Hussain, that expressed support for al-Arian were said to have been said by someone else. Instead, the American people were told BY THE WHITE HOUSE that it was al-Arian’s daughter who actually said them, thus maligning the writer and WRMEA editor. The editor willingly went along with the false narrative. Fox News reported that the editor, Delinda Hanley claims the edit was made in February, 2009. The Web version of the 2004 article in the Washington Report on Middle East Affairs was later edited to delete all of Hussain’s comments. Editor Delinda Hanley told Fox News she believes the change was made in February 2009, though she does not recall who requested the edit. The truth is that it was Hussain and the Obama administration who wanted his defense of al-Arian removed from the article. That Hussain was not fired is what implicates Obama. After all, in February of 2009, Hussain had just been given a high-profile position as deputy associate counsel to President Obama. Hussain’s defense of al-Arian would be bad PR. After being elevated to OIC Envoy, a position with a much higher profile, interest – albeit briefly – was taken in Hussain’s 2004 comments at the MSA event; the MSA has been identified as a Muslim Brotherhood front group in the U.S. The coverup and backtracking by Hussain and the White House began. Then late on a Friday evening (10:09pm EST to be exact), February 19, 2010, the POLITICO reported that there was an audio recording of the 2004 event. The words were indeed said by Hussain and he had to admit to having said them. Yet, there were no consequences and even Fox News all but dropped the story. As an aside, none other than Daveed Gartenstein-Ross actually published a defense of Hussain after the audio recording was released. Even if one is inclined to dismiss evidence that Hussain is sympathetic to Muslim Brotherhood front groups, the fact remains that he attempted to coverup what he said about al-Arian and then lied about it. Gartenstein-Ross is someone with whom Shoebat.com is somewhat familiar. In 2013, he gave bizarre testimony at a House Subcommittee hearing in response to questions about Ansar al-Sharia. Perhaps ‘deported’ is the wrong word to use in the case of al-Arian, simply because of where he went. Even when Qatar was feeling pressure to jettison Hamas leaders – including the group’s leader Khaled Meshaal – it was Turkey that openly welcomed them, as Shoebat.com reported. There is absolutely no reason to suggest al-Arian will be welcomed any differently. Once called a ‘master manipulator’ by a federal judge, al-Arian was revealed as a major player with Palestinian Islamic Jihad (PIJ), a group closely connected to Hamas and the larger Muslim Brotherhood group. Turkey has openly embraced the Muslim Brotherhood and al-Arian is likely to be seen as a living martyr who refused to testify against another Muslim Brotherhood front group and was held in contempt. …instead of Al-Arian being expelled, the legal drama continued when prosecutors in Alexandria, Va., sought his testimony in a separate investigation there. He refused, saying he had carefully negotiated the Florida plea deal to exclude the usual requirement to cooperate with government investigations. But appellate courts ruled that prosecutors were within their rights to subpoena Al-Arian in the new case. They sought his testimony in a long-running, terror-related grand jury investigation focusing on a Herndon, Va.,-based organization called the International Institute of Islamic Thought,which was raided by the FBI in 2002 and had provided funding to the think tank Al-Arian founded. In 2008, prosecutors in Virginia filed criminal contempt charges against him for his refusal to testify about that despite a grant of immunity. The case languished, with the Al-Arians living under house arrest at their daughter’s Virginia home, until a federal prosecutor agreed to dismiss the indictment last June. As Shoebat.com reported, the U.S. State Department recently received a Muslim Brotherhood delegation from Turkey. That delegation was made up of individuals from the Egyptian Revolutionary Council, a group of Muslim Brotherhood members and sympathizers who fled Egypt after Mursi was overthrown and whose objective is to overthrow el-Sisi. As a leader with PIJ who chose jail over testifying against a Muslim Brotherhood front group known as the IIIT, al-Arian will be welcomed with open arms in Turkey. The Obama administration once again demonstrates it’s in league with Turkey and the Muslim Brotherhood, which makes it quite radical. LEST anyone believes that his helping hands are outstretched exclusively to his Sunni Brothers, think again. The Jihadi-in-Chief is overjoyed at the hegemonic trajectory of like-minded Shia Islamists. How so? Can anything be more demonstrative, other than his absolute determination to bring Iran’s genocidal mullahs to the nuclear break out point? Of course not. This fact is beyond dispute. NOT only that, but the Houthi’s Yemen coup was blessed by Iran, and by the Jihadi-in-Chief! MOST significantly, as long as American interests are harmed – be it through Sunni or Shia props – well, HUSSEIN Obama is front and center. In fact, he was so determined to release TOP Taliban jihadists (freeing a traitorous soldier too) that he violated a law that he signed onto! IT doesn’t get any clearer than that, as to his ill intent. CONCOMITANTLY, is it any wonder that this site deems him “Allah’s (White House) Muslim Terrorist”? THEREBY, “deporting” Palestinian Islamic Jihad’s (PIJ) top terror dog in America to Erdogan’s Islamist Turkey (yes, it couldn’t have happened without HUSSEIN Obama’s say so) is exactly the path that a dedicated Islamist-in-Chief would take! Resultant, how much easier, freer, will Al-Arian be to continue his jihad, now that his terror ties have been exposed in America? ABSOLUTELY, despite the moaning and bitching by leftists and Islamists – yes, Al-Arian is the “victim” of a political witch hunt – the fact remains that he IS a jacked up PIJ leader! No amount of spin will cover his bloody trail. None at all. HUSSEIN Obama, thou art verily complicit! This entry was posted in Uncategorized and tagged ‘deported’ to Turkey, clear and present danger, Houthi's Yemen coup, http://islamexposed.org/2015/02/12/top-islamic-dog-pijs-sami-al-ariandeported-by-jihadi-in-chief-assists-sunni-shia-alike-to-what-end/, http://www.examiner.com/article/facebook-yanks-restores-anti-islam-page-after-admins-receive-death-threats, http://www.israelsvoice.org/2015/02/12/top-islamic-dog-pijs-sami-al-ariandeported-by-jihadi-in-chief-assists-sunni-shia-alike-to-what-end/, Iran's genocidal mullahs, Palestinian Islamic Jihad (PIJ), Rashid Khalidi, Sami Al-Arian, six degrees of separation, TOP Taliban jihadists, tracking down jihadis, traitorous soldier, Turkey's Erdogan by Adina Kutnicki. Bookmark the permalink. according to Islam satan himself is the biggest Victim. To the “biggest deceiver himself, their god! Pingback: Israel's Voice | TOP Islamic Dog, PIJ’s Sami Al-Arian,”Deported” By Jihadi-in-Chief. Assists Sunni & Shia Alike.To What End? Adina, next week 2100 troops will be returning from the Ebola hot zone to serve their 21 day quarantine at the largest US military installation in the world, Ft. Bragg NC. What could go wrong. Who needs ISIS when we have Obama as CIC?